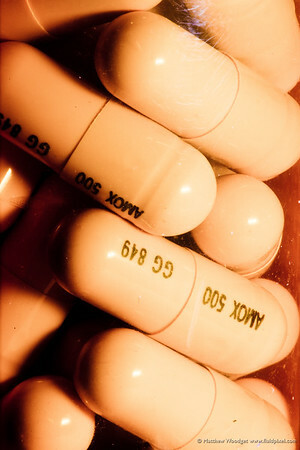 antibiotics | Photography, Storytelling, & Growth Marketing by Matthew Woodget. I’m visiting with friends and family in the homeland (UK) and my poor mum has a tooth infection. That quote is from my mums dentist, my old dentist in fact. In short the dentist said that the bacteria we have in our bodies isn’t the same as what it was 30 years ago. We are subjected to antibiotics daily in our food. Mainly in meat. Animals are given it even if they don’t need it… which reinforces my pursuit of local, range raised, as free range and ideally organic meat. If animals were raised as animals and not in close quarters as output from a factory they wouldn’t need to be fed antibiotics as they wouldn’t be living in conditions that resulted in sickness and thus needed medication. Bottom line is we are reducing the efficacy of antibiotics for healthcare because we are abusing it for cheap meat. I highly recommend reading Michael Pollan’s works.